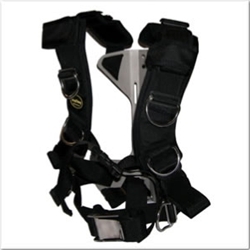 An adjustable harness designed for backplates. A Fastex clip on each chest, SS belt buckle. contoured and comfrtable shoulders, two SS D-rings on each side of the chest and one on each hip, and a crotch strap. It is extremely comfortable and has many adjustment features.